Jules is born and bred in Yorkshire, leaving for a while to study in Scotland and travel abroad; this Yorkshire lass is now based in lovely Sheffield. 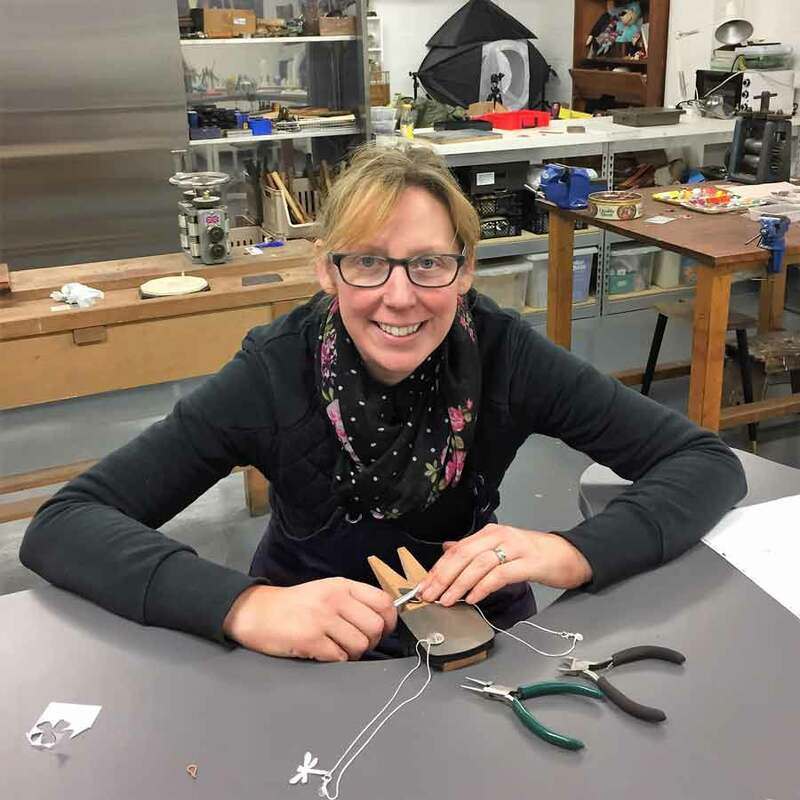 Jules is a fully qualified designer maker and lecturer with over 15 years of teaching experience and has exhibited work widely in galleries across the UK. Jules makes fun wearable pieces of jewellery and objects of curiosity inspired by museum collections and found objects. Current work explores ways to celebrate, commemorate and share objects through sensory, imaginative and storytelling engagement. "I make jewellery and objects that explore ideas surrounding connection, place, narrative and conversation - collector, maker, lecturer, workshop facilitator and object interpreter". 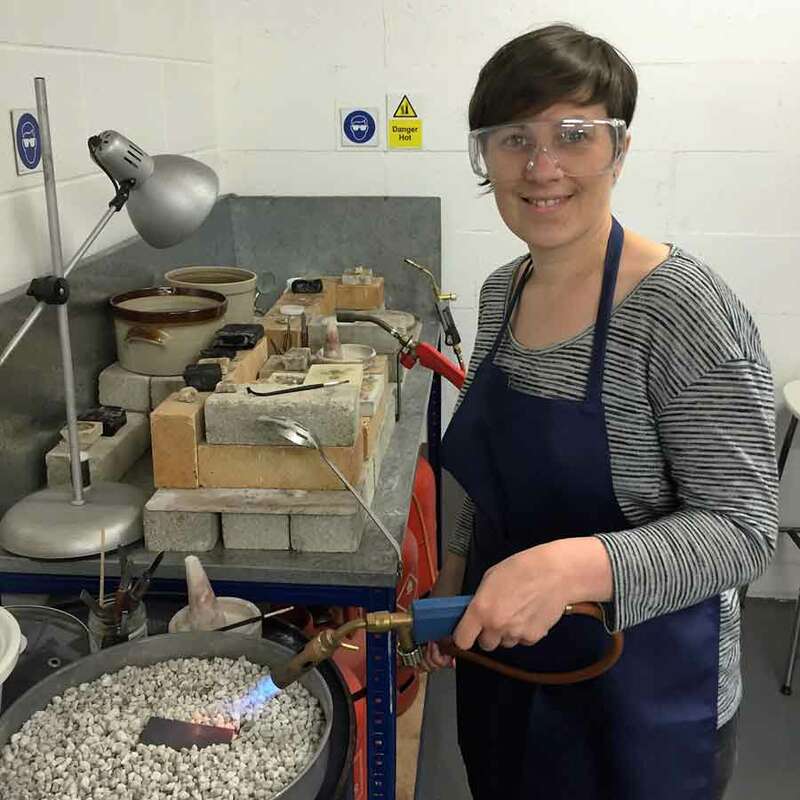 Jules is also associate lecturer at Sheffield Hallam University on the BA and MA Metalwork & Jewellery courses. Jules firmly believes that everyone can learn how to make objects and jewellery and loves to teach and facilitate this. Come and visit the studio, meet Jules and find out more about how to get creative. 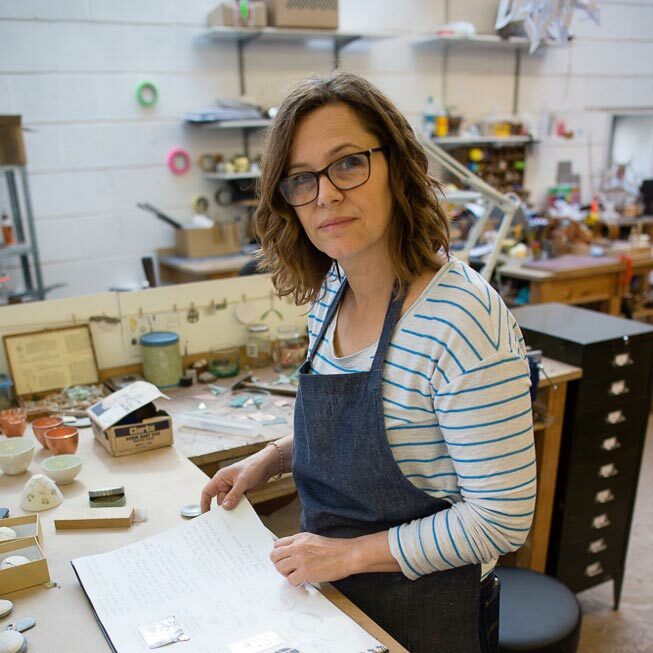 I am an artist, silversmith and maker running my own practice alongside delivering specialised workshops. I completed an MA design: Jewellery and metalwork at Sheffield Hallam University in 2014 and have been growing my business since then. Within my practice I engage with the whole process of creating handmade one-off pieces to exhibit and sell thorough various craft fairs and galleries. My current work is a collection of decorative vessels and spoons of varying scale which are created using traditional silversmithing techniques such as hammer raising and forging. I work with a variety of precious and non- precious metals, often incorporating wood as a contrasting material. I thrive on learning new skills to apply to my work and a fundamental element to my practice is sharing my knowledge and skills with others. 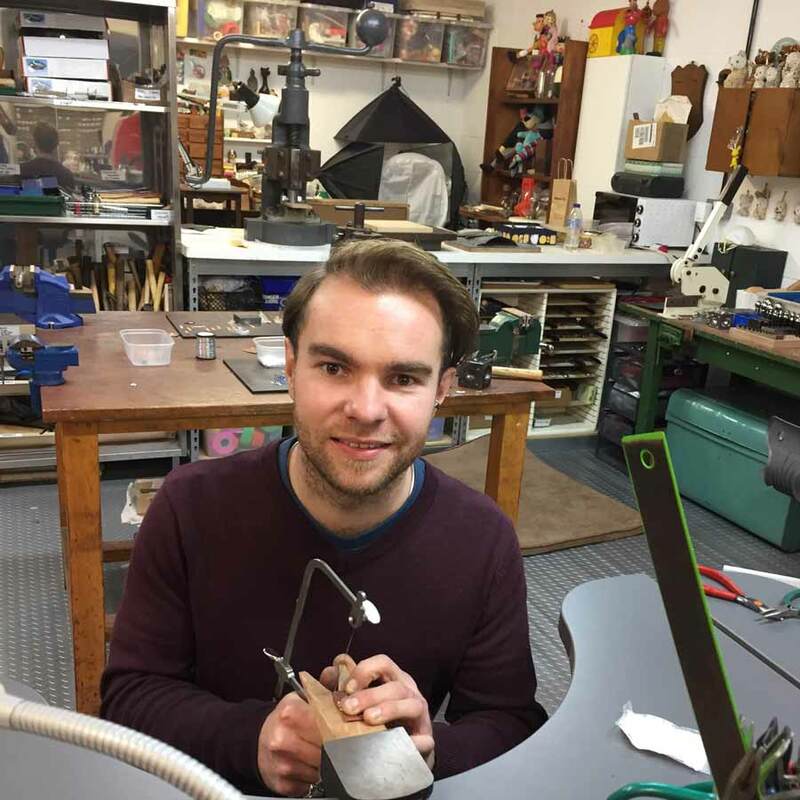 I started out at Chesterfield College where I specialised in jewellery and silversmithing for three years and I found an interest in hand raising and silverware. I explored many techniques over several years which I adapted and developed at university in Loughborough. While at university I developed a technique that I invented at college which was to do with the colouration and patination of copper. My work was heavily influenced by Wabi Sabi and The Japanese Tea Ceremony. My work was based on imperfection, simplicity, distortion and transience but always mindful that whatever I made had to be made well. While at college I was shadowing a jeweller in Sheffield who helped me progress my skill set and knowledge in precious metals and stones. I stayed alongside him throughout my academic career and until I had finished my teaching certificate where I now currently work as a self employed jeweller and silversmith to the trade. I am a Jewellery designer and Silversmith based at Yorkshire Artspace in Sheffield. I recently graduated from Sheffield Hallam University with a Master of Arts Degree in Design (Jewellery & Metalwork). My work aims to capture the essence of fragility and preciousness found in nature. I am inspired by the natural landscape; in particular the minute, delicate structural details of botanical specimens found in local wild meadows, woodlands, hedgerows and gardens. I collage and juxtapose diverse materials to create balance and harmony in the wearable jewellery pieces and decorative objects I make, as a reminder of the importance of connectedness to nature and to emphasise the responsibility we all have to nurture and preserve biodiversity, as human impact continues to threaten what we have left. I am exploring ways to imprint precious and non metals to capture memories of impermanent natural materials, making them permanent, contained, and 'fossil-like' in appearance. The vintage confectionery tins i have repurposed tell stories of past lives and have been worn beautifully over time adding to the narrative of my jewellery pieces, evoking memories and a felt recognition. The tin allows me to introduce accents of colour and patterns chosen for their reminiscence to the natural landscape, to evoke a sense of place, time or memory, peacefulness and tranquility. Before working with metal, I worked as a Textile Designer with print and pattern. I have always enjoyed drawing, especially wild plantforms. I was commissioned by Liberty to make flower drawings for several Liberty Art fabrics, one of which is used in the Flowers of Liberty collection, for the Theodora product range. 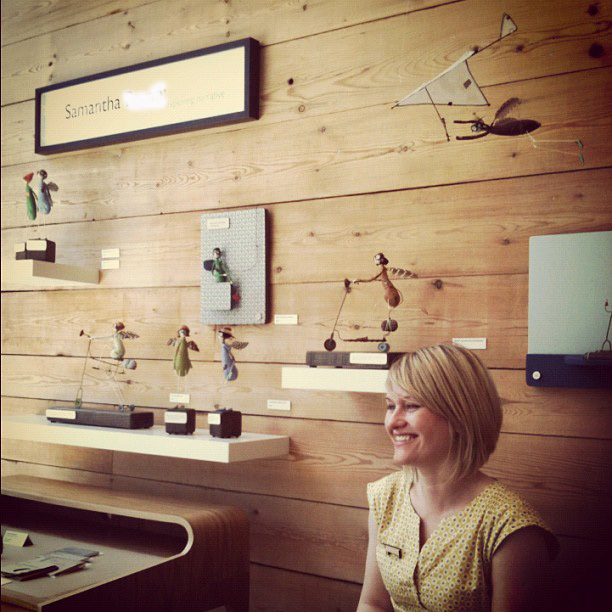 Samantha is a visiting tutor at Studio Budgie Galore. Inspired by Victorian Gadgetry and Invention Samantha Bryan creates suspended, wall mounted and free standing sculptures out of a combination of wire, leather, found objects & collected materials. These unusual sculptures depict everyday life in ‘fairyland’. Samantha has gained both National and International recognition for her work with numerous public commissions and a number of works held in gallery permanent collections and many with private collectors.